Dporticus Garden Dump Cart has an all-steel construction and rugged air tires,makes hauling and unloading heavy loads easy on any terrain. The durable poly bed is easy to clean and won't rust.It is a great alternative to the traditional wheel barrow. Made of high quality material, firmly and durable,the surface is rustproof and wear-resistant,easy to clean,which last a long time. Equipped with a rubber grip in the handle for comfortable hand placement while steering. 10" ball bearing wheels with pneumatic tires allow the cart to roll in various types of terrain. High quality iron wire connecting procedure which could make this cage more durable and solid. 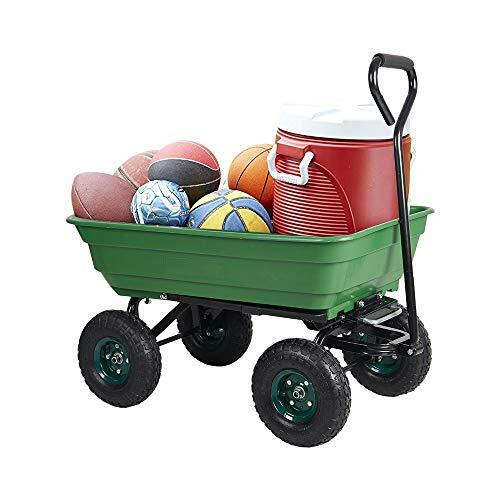 This cart is perfect for haul gardening tools or supplies in the yard. View More In Garden Carts. If you have any questions about this product by Dporticus, contact us by completing and submitting the form below. If you are looking for a specif part number, please include it with your message.